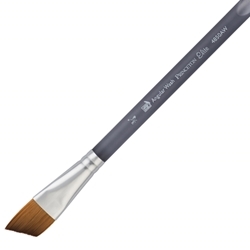 Princeton Elite Synthetic Kolinsky Sable Watercolor Brushes - Angle Wash - Size 3/4"
Home / Brushes → Watercolor → Synthetic → Princeton → 4850 Series Elite Synthetic Sable → Princeton Elite Synthetic Kolinsky Sable Watercolor Brushes - Angle Wash - Size 3/4"
Elite is the next generation of synthetic watercolor brushes. They perform like genuine Kolinsky; the round shape has a belly for maximum color holding capacity and an amazing point for fine detail work. They also feature a velvetouch finish handle for maximum comfort.